Skiing is a great winter sport. It can be enjoyed all over and is a fantastic way to enjoy all that winter has to offer. Here are a few of the ski areas in the country with great ski schools for beginners to learn. This year round mountain resort is filled with amenities beyond the excellent skiing, including a skating rink and a big spa. There are over 90 trails on over 3,000 skiable acres. Northstar-at-Tahoe also has some great terrain parks, as well as options for cross-country skiing. The summit elevation is over 8,600 feet and a vertical drop of 2,280 feet. The ski area gets an annual average snowfall of 350 inches. Skiers can also enjoy the 344 acres of backcountry terrain, and even 7 trails for tree-skiing. The resort offers lessons for skiers of all experience levels, including advanced and expert. For beginning children there are private lessons, small lessons and even group lessons, depending on the atmosphere desired. Beaver Creek gets 300 days of sunshine and the season can last well into April depending on the weather conditions. There are 1,815 skiable acres, served by 25 lifts, with 149 trails. The summit has an elevation of 11,440 feet, and a vertical rise of 3,340 feet. Skiers at this resort will enjoy the wide range of slopes that cater to a wide variety of experience levels. 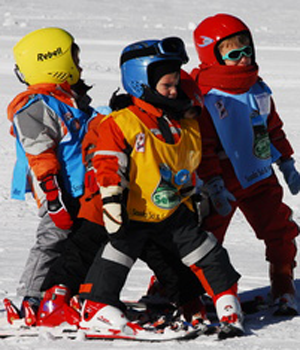 The ski school at Beaver Creek is catered to the age level of the students. Visitors can find both ski and snowboarding lessons, which have a great lunch program and lots of fun. Copper Mountain is one of Colorado's fantastic resorts. The resort has 2,465 skiable acres, with 22 chair lifts serving 126 trails. Copper Mountain gets plenty of snow each year, with an annual average snowfall of 282 inches. The summit is at 12,313 feet, and a vertical drop of 2,601 feet. Visitors to Copper Mountain will find excellent options for lessons. From children to adults and private to group lessons. The mountain has excellent coaches that can make a really great learning experience. Keystone is a great destination for skiing, and it also has great options for beginning skiers. The ski area gets an average of 235 inches of snowfall annually. There are 3,148 skiable acres, has 20 lifts and has 135 trails. The summit elevation is 12,408 feet and has a vertical drop of 3,128 feet. Keystone offers lessons for skiers of all ages. Visitors can take private lessons or join in the Children Ski & Ride School. Whatever type of ski school visitors want to take, they are sure to have fun and learn all about skiing at this fantastic resort. Steamboat Springs is a beautiful skiing destinations. It is composed of six peaks, with 2,965 acres of skiable terrain. There are also many places to enjoy skiing in the trees. The highest elevation is Mt. Werner, which has a summit elevation of 10,568 feet, and has a vertical rise of 3,668 feet. Steamboat Springs has a great ski school. There are classes for everyone, including private clinics as well as group classes, for beginners and for those with a little experience. Vail is consistently considered on the the best ski resorts in North America, and it is the largest ski resort on the continent. Originally the resort started as a European-style ski village and now it is one of the best ski areas in the world. The ski area gets an average of 350 inches of snow annually, in addition the ski area has 5,289 acres, a peak elevation of 11,570 feet and a vertical rise of 3,450 feet. Vail has 193 trails, 53% of those trail are expert level runs. The ski area is served by 31 lifts and there are 3 terrain parks, a superpipe and a halfpipe. Vail has one of the best ski schools in the country. The instructors have plenty of experience and make learning to ski a fantastic experience. Bretton Woods Mountain Resort, also known as Mount Washington Resort is located in Bretton Woods, New Hampshire. Bretton Woods is the largest ski area in New Hampshire, with 434 skiable acres. The ski area has 101 trails, 10 lifts and four terrain parks. The resort also has night skiing. Bretton Woods Hobbit Ski Program and Snowboard Program have great day programs which include lessons and a lift ticket. Big Sky, Montana is an excellent spring skiing destination, made even better because of its uncrowded but amazing slopes. This resort has winter weather that lasts through the spring. It has 3,832 acres of skiable terrain, with a vertical drop of 4,350 feet, with 150 runs. Big Sky gets over 400 inches of snowfall annually, and the summit is at 11,166 feet. Big Sky has some great classes to help skiers and snowboarders of all ages enjoy the mountain. There are classes for adults and children at all different levels of experience. Deer Valley Resort is another 2002 Winter Olympics venue. It is known as one of the best resorts in the country, and it has great skiing. However, the mountain does not accommodate snowboarders. It is a great destination for skiers with a total of 2,026 skiable acres over six mountains, with a vertical drop of 3,000 feet. There are 100 runs, 1 Tricks 'n' Turns Park and 22 lifts. Deer Valley has a fantastic ski school. There are plenty of instructors for the children, and they even get to use the terrain parks. Smugglers Notch is known for its great family ski area and fantastic ski school. The ski area is located in Smugglers' Notch, Vermont, just 2.9 miles from Stowe. The resort is compiled of three interconnected mountains, Madonna, Sterling and Morse. The ski area has a top elevation of 3,640 feet with a vertical drop of 2,610 feet. There are 78 trails with 8 lifts and 310 skiable acres. Smugglers Notch has over 1000 acres of terrain and the Nordic Center offers 58 kilometers of cross-country and snowshoe trails. Another bonus at Smugglers' Notch has the only triple black diamond on the East Coast, Black Hole. Smugglers Notch also has a well-known ski school, with programs for children as young as 3 years old. There are day programs that combine a great education with a day of fun and much more.